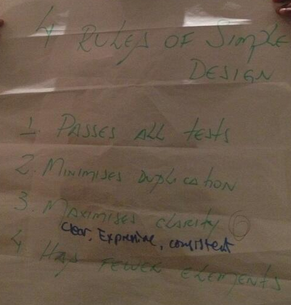 SoCrates UK 2013 – my experiences! It’s about 15:21 on 19th September, a group of us from the London Software Craftsmanship Community gathered to leave for SoCrates UK 2013. We all gathered in the same and luckily found empty seats next to each other. Amongst a lot of jokes, we suggested lets do a small dojo in the two hours we will be travelling. Wifi is free but terrible, on this train – nevertheless we tethered our phones and enabled Wifi on our laptops to make the most of the bandwidth. One thing lead to another, and before we knew, we were going through the above list of habits – some found the habits difficult to remember, others found duplicates and overlaps. 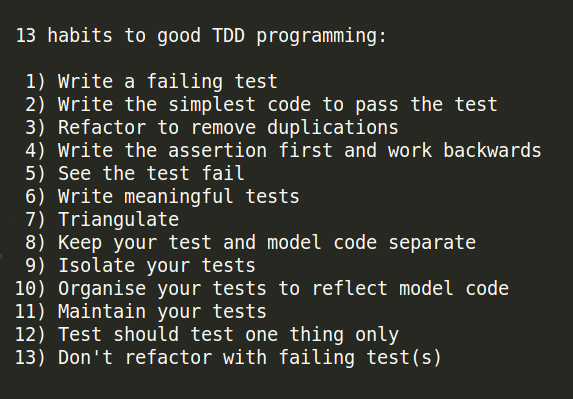 There was this tendency that, this is a big list to remember when doing TDD! So like developers we said we can “refactor” these habits into something more meaningful, maybe even organise them as per our thinking process. You can notice already that the 13…habits shrunk to 12 habits, and their order changed in comparison to the original. – you start the development with tests, and change the tests if goal is not achieved via model (domain) code. – No guidelines about design, flexible approach. – test drives the model code, you never change the test, only model code to reflect any changes that does not satisfy the tests! Guided by design. Soon we arrived at Moreton-in-Marsh and our focussed changed to getting a taxi to the venue. I continued contemplating with the idea of collaborating with other developers and ironing our this list – so it can be helpful at the least. I met @gonsalo and @sandromancuso and ran the idea by them and they thought it was certainly an idea to present and get others involved to see what the final outcome could be. Next morning everyone was proposing their presentations at the “Open Session”, and I took the chance of presenting – Refactoring TDD habits… in the Cheltham Loft room in the house called Coach at the Cotwold estate! 30 minutes into the conversation and we already attracted discussions between @sleepyfox and @sandromancuso, we did try to persuade them to avoid tangenting from our core topic of discussion. The idea is that all your actions and practises could use these as guiding light to keep on track. An hour and few minutes later and we have refactored and cleansed the original 13 habits down to 12 habits – reshuffled and rejuvenated. They may not be perfect but close (Kent Beck: use ‘perfect’ as a verb, not a noun – its a journey not a destination! 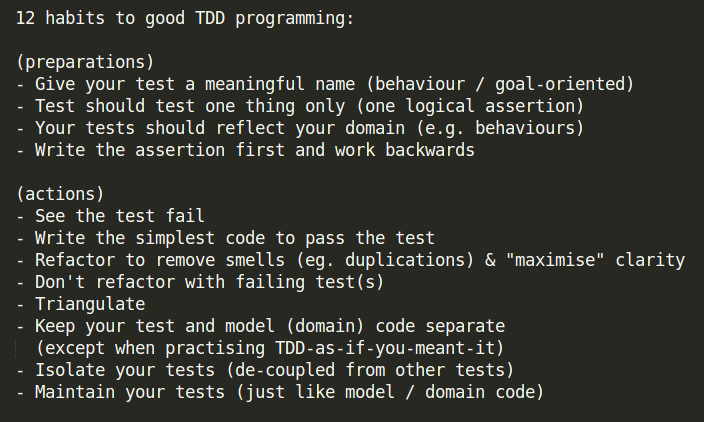 I sincerely hope that these list of habits do cover the essence of the principles, values and practises of TDD programming. Prepare yourself with things you should or should not do, and then perform the Red-Green-Refactor actions to satisfy the TDD process. I also brought up the topic of the difference between Test-first development and Test driven development – and there were disagreements about it amongst the attendees, on the meanings of the definition itself. Please share with me your input! @CarlosBle – please feel free to come up with your time-based / non-linear list and share it with us when you get a chance. Although we got a lot out of the session with discussions on various topics, we haven’t covered everything and finished discussing everything! I’m more of the idea, that we could try to look at the above habits as trigger points (practical and pragmatic use) to make us do the right things when we are writing code with the intention of writing good code…clean code…quality code…whatever the terminology be in your environment. At the end of the day, good practises become habitual only when practised repeatedly, with focus and intent. Please do provide constructive criticism, if any, such feedback to the above are very welcome as they help improve the quality of the post! Thanks to @sandromancuso & @sleepfox for helping and participating during my session. Big thanks to Socrates UK – its host, facilitators, organisors and sponsors for making this event happen! R as some of you may know is a statistical and graphics programming language (see Wikipedia ) used by academia and recently by IT professionals of our ever growing software industry. There is a sudden demand for Data Scientists, Data Analysts and Statisticians with a background in R among other things data and development related subjects. I have been fortunate to work with such a programming language, even though I haven’t had any prior experience working with such a programming language and moreover with Data Scientists. My interest in Mathematics and affinity for numbers drew me to learning it, and with further help of Herve Schnegg our in-house Senior Data Scientist, I was able to pick a fair bit of the subject. I went through a few hours of tutoring by getting an understanding of the R environment, how to install it, and an overview of RStudio and how amazing it is! What fascinates me, is that you can load objects into memory and play with it and when you shutdown your environment your data is not cleared! Rather you can save it (into the .Rdata file) and it retains such information per project! You are able to remove individual objects from memory, view them, modify them, and reload them from the command-line or by just executing single lines of code in your R script file (they have the obvious extension of .r) in an IDE like RStudio. R gives developers access to a REPL (stands for Read–eval–print loop ) environment and thats how you are able to do the above actions seamlessly! A number of other popular languages have a similar environment i.e. Clojure, Haskell, Python, Ruby, Scala, and Smalltalk, and so forth. or defined the function in the beginning of the script file before referring to it, at a later stage! I had to learn this by the trial-an-error-then-ask-the-experts-around-you method. Contents of any object can be viewed by referring to the object at the REPL CLI, that’s kind of easy! 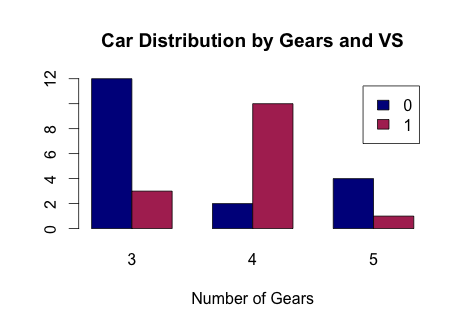 And voila, you get a nice simple looking bar graph! Thanks to a helpful R blogger who has put together some resource for us: Using R to plot data . Note: the par (bg=”white”) command sets the colour of the canvas for the entirety of your session. I wrote my own suite of very simple logging functions that log messages to the console depending on the nature of the message, these messages can of course be piped into a text file at run-time. As you will know, the way R is, it is wise to have logging functions to hand, to dump values of variables when running scripts. Just because sometimes the error messages thrown by R can be obscure, which has been my finding during my pursuits. Hence I resorted to the above functions and relieved myself from annoyances during exceptions.Later some passed me a link to an R Logging library (an implementation of log4j in R) . At the moment I’m refactoring bits of code I wrote during the last two weeks and still have many blocks of code to go through to find suitable method functions to place them into – our purpose is to make the code more readable, scalable and maintainable. Just now in the process of replacing the slow and verbose for-loop like constructs with their equivalent xapply() functions. By doing this we will gain in speed and compactness with regards to the lines of code. 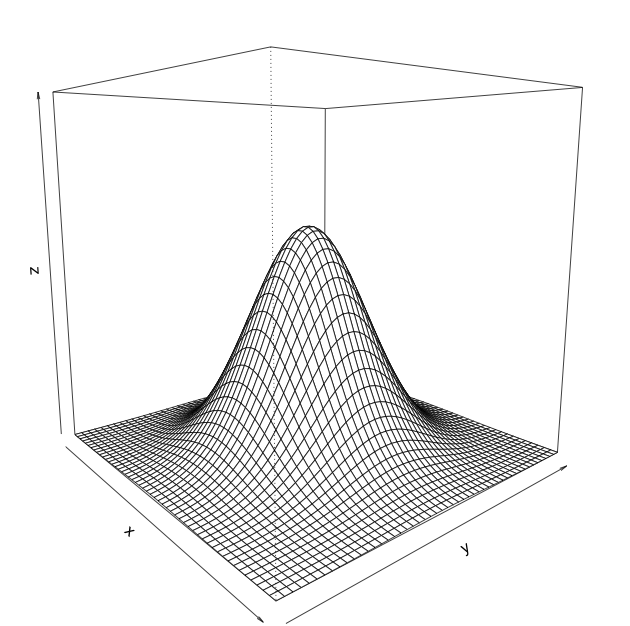 R gives us a number of Map–Reduce like functions to play with, here’s a blog  that covers the topic on the xapply() functions. As R is an interpreted language, if you don’t write efficient functions, you could end up waiting a bit longer than expected, before any results are thrown back onto the console. It is not verbose and does not usually tell you what it is upto. We spent most of our two weeks performing this action as we came across performance bottlenecks in our scripts and could do with using the xapply() like functions. Applying them improved the performance of certain tasks from several hours to a reasonable number of minutes per execution. “Measure, don’t guess.” was the motto! Thanks to the sequence of calls to the proc.time() function, which we used voraciously to measure performances of the different blocks of code we thought needed attention. This paid off at the end of the process as we were able to determine how much time it would take for the script to transform and validate the heaps of data we have been playing with. The last action gave us a better grip over the performance and we were confident that if we had to run all the data we had through the script, we would be able to finish transposing it within several hours as opposed to a few days, previously. The tasks of processing each file was split into 3 to 4 sessions processing 1000 records per session. But it wasn’t as easy as said, we had a number of sessions running doing the above on different pieces of raw data, but never got to committing the data into the database and wondered why? We thought it was hardware/software limitations on our systems. But after further investigations and experimentations found out that no system can handle writing mega-tons of data from memory into the database system without creating giga-tons of swap files. And these swap files are a catch-22, because now the OS needs resources to manage its own resources so our resource requirements would take a back seat! After a couple discussions, and trials we finally decided to write data back into the database system, in smaller blocks at a time, which means we can still have multiple sessions running in the background and have each one of them write smaller blocks of data into the database. Once data had been transformed and written to a database, we wrote a script to validate the data written into the database, we chose Postgres as a trial, and found it was a pretty good database system with an intuitive SQL language. The verification process was run in the same manner in parallel which took similar amount of time, so at the end of the 7th hour we had both the data written into the database and verified. 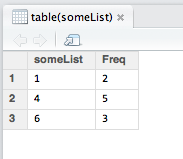 R can write to such a database system easily. We were further helped with the primary, simple and compound indices that we created to facilitate the searching and selecting processes that our SQL statements would make it do. Postgres also has an efficient caching mechanism, which helps further speed things up. We have parked these ideas for now, but it will be a great experience to be able to explore them at a later date. But once again it was techniques over technology that made our day. Rory Gibson, rightly said “Its not surprising to know how game developers produce some of the best pieces of work under restricted environments”. Such situations are a good nudge to everyone especially developers when faced with performance bottleneck – look at your code not your machine first! At the end of it all, it feels we did what Hadoop or Cloudera would do to our jobs – split, slice, execute, verify, put together and bring back the results at an efficient speed. The time I spend learning and applying R, I had to get familiar with its unique or rather say different from other programming language syntax. Like the use of the <- (arrow sign or indirection operator) instead of the usual = (equal to sign). How you point the arrow makes a difference in R, instead of assigning a value to a variable or function you might end up doing something else if you are not careful. You need to define your functions at the top first, otherwise you can’t refer to it. And all entities are case-sensitive, please pay careful attention or else you will only be notified when you least expect it and in the middle of an execution of a block – remember its an interpreted language, no compile time warnings / error messages are available. There was one more hurdle which put the spanners at work for us – we bumped into an encoding/decoding issue with reading data from the raw file. The ESS plugin  in Emacs was reading the data literally at a stage and not evaluating the escape codes. When we switched to RStudio or even the R repl, we immediately became free from the issue – this was also because both I and Herve were using different development environments. He used Emacs to develop in R while I used RStudio. Why this was happening is not known to us, we think there might be a bug in the plugin – at this stage its still a speculation, but more importantly we don’t have to investigate the issue anymore.Our raw file was written using the application called SPSS which writes data in a proprietary format. Such files can be read via a few ways, and using R is one way to achieve that. There is also a Java library  that facilitates reading such files, but remains unexplored at this time. This is where I have still been hovering around with regards to R, I came across two libraries that enables writing unit tests in R, i.e. RUnit and svUnit. See below in the External Resources section for a number of links I have put together while searching for TDD methodologies in R.
It still needs to be investigated further but a promising start – since test-first driven development is a great way to start working on any piece of problem in any programming language of choice. Another action which has been a continuous process since the start. We have applied it to generalise, and make the code base more compact and manageable. Move away common function calls into another .r file and called it into our main script using the source() function. Make our work more maintainable and re-usable – basically keep our code-base clean and tidy. 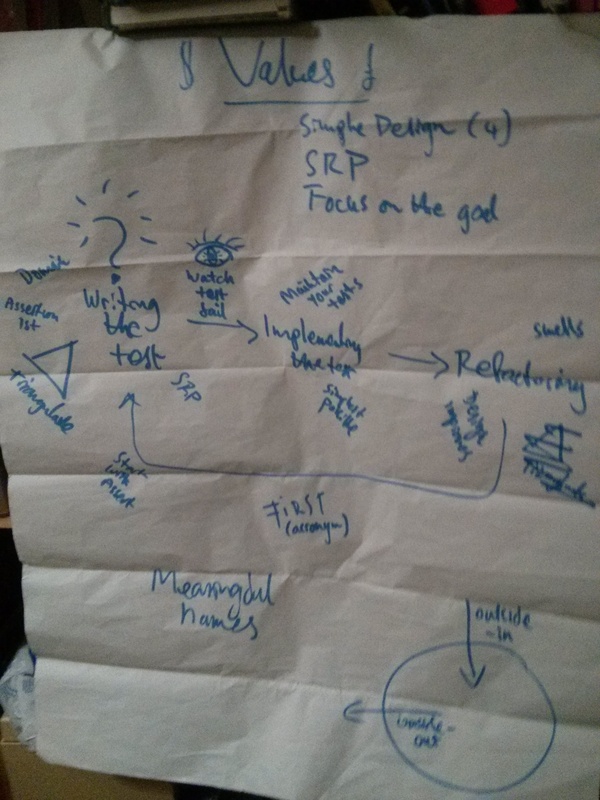 I learnt that refactoring is a continuous effort – its a journey not a destination. I and Herve both took away a lot of learning both technical and non-technical from the whole process – pair-programming and pair-investigation of a problem space, as the old adage goes “Two minds, are better than one.” Also reveals another reason why pair-programming is encouraged as part of a development process. One important point: we learnt that when we started working on this project, slicing it into simple smaller atomic chunks when solving a problem was effective and efficient, and learnt the hard way. Also when we had a solution to apply to a dataset, we had already decided to only apply any experimental solution to a smaller subset of the dataset first, verify the results and then scale it incrementally till the dataset was exhausted. Both these working methods came to our rescue and reduced the combination and permutations of trial-and-error! We both exchanged ideas that we were new to and very well incorporated many of them into our work methods and was able come up with a fine, and a re-usable solution. I have taken this project further by documenting the work, continuing with refactoring the script files, writing this blog post, and tidying up the project space as a whole.This blog comes about as a documentation of our trial to check the viability of different platforms that could serve us as an ETL (Extract, Transform, Load) – of which we have made good use of R. Whether R is brilliant at it, or another tools serves betters is debatable. R stands good at what it does, and it does it well – but can be used to do light/medium weight ETL work.So what would be the next tool or platform of choice for our next ETL project. We can’t tell which one is better till we have tried a few and benchmarked them against their pro-s and con-s.
Herve Schnegg – for a good partnership during our R session the last couple of weeks, and all the input and learning. Rory Gibson – for lending his reviewer eyes, for reviewing our R work I and Herve did and also for reviewing this post. This blog has also been published on the web’s popular R blogging site: http://www.R-bloggers.com. During my quest, while learning and applying R, I came across the below links that could come useful to anyone who is interested in furthering their knowledge.